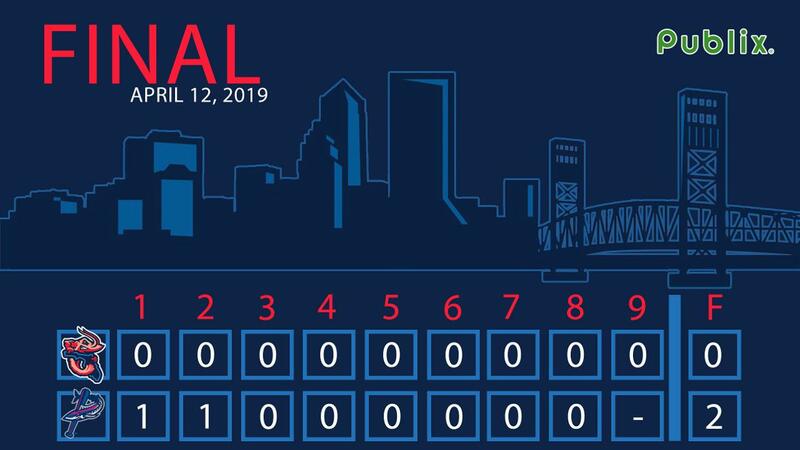 PENSACOLA, Fla. - The Jacksonville Jumbo Shrimp (3-5) fell to the Pensacola Blue Wahoos (6-2) by a 2-0 score in the third game of the five-game series at Blue Wahoos Stadium on Friday night. Pensacola left-handed starting pitcher Devin Smeltzer (2-0) earned the victory with eight and a third scoreless innings, scattering three hits with a walk and eight strikeouts. Jacksonville right-handed starting pitcher Jorge Guzman (0-1) took the loss, allowing two runs (both earned) on four hits with a walk and five strikeouts, and his last four innings on the mound were scoreless. Pensacola right-handed relif pitcher Cody Stashak earned his first save of the year by retiring the final two Jumbo Shrimp batters. The Wahoos struck first in the bottom of the first inning, as Taylor Grzelakowski delivered an RBI groundout to first to score Jordan Gore from third to put Pensacola's lead at 1-0. Tanner English added an RBI single in the bottom of the second to grow the Wahoos lead to 2-0, which would be the final. Magneuris Sierra extended his hitting streak to six games with a single in the fourth inning, and reached base three times. Brett Graves worked a scoreless two innings in relief for Jacksonville with four strikeouts while allowing no hits. The Jumbo Shrimp and Blue Wahoos will continue their series with the fourth game of the five-game set on Saturday night at 7:05 p.m. eastern. Right-handed pitcher Jordan Yamamoto (0-1, 3.60 ERA) will start for Jacksonville against Pensacola right-handed pitcher Griffin Jax (0-0, 0.00 ERA). Fans can listen to the game on the Jumbo Shrimp Network presented by Community First, beginning at 6:50 p.m. with the pregame show "Shrimp On Deck" locally on Sunny 102.3 FM, on the TuneIn Radio app, and www.jaxshrimp.com.